This looping animation shows a wide-angle view of the star HD 106906 taken by the Hubble Space Telescope and a close-up view from the Gemini Planet Imager, revealing a dynamically disturbed system of comets, suggesting a link between this and the unusually distant planet HD 106906b (upper right), 11 times the mass of Jupiter. 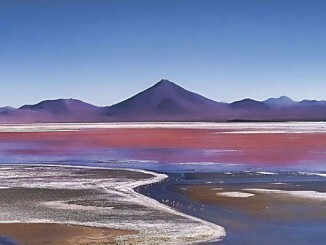 Image credit: Paul Kalas, UC Berkeley. AN animation: Ade Ashford. A planet discovered last year sitting at an unusually large distance from its star — 16 times farther than Pluto is from the Sun — may have been kicked out of its birthplace close to the star in a process similar to what may have happened early in our own solar system’s history. The planet may even have its own ring of debris it dragged along with it when it was expelled. “The measurements we made on the planet suggest it may be dustier than comparison objects, and we are making follow-up observations to check if the planet is really encircled by a disc — an exciting possibility,” said Abhi Rajan, a graduate student at Arizona State University who analysed the planet images. Such planets are of interest because in its youth, our own solar system may have had planets that were kicked out of the local neighbourhood and are no longer among of the eight planets we see today. The disturbance could have been caused by a passing star that perturbed the inner planets, or a second massive planet in the system. The GPI team also looked for another large planet closer to the star that may have interacted with the exoplanet, but found nothing outside of a Uranus-sized orbit. Kalas and Rajan discussed the observations during a Google+ Hangout On Air on 1 December during Extreme Solar Systems III, the third in a series of international meetings on exoplanets that this year takes place on the 20 anniversary of the discovery of the first exoplanet in 1995. Viewers without Google+ accounts may review the AAS online press conference via YouTube. A paper about the results, with Kalas as lead author, was published in The Astrophysical Journal on 20 November 2015. The star, HD 106906, is located 300 light-years away in the direction of the constellation Crux and is similar to the Sun, but much younger: about 13 million years old, compared to our Sun’s 4.5 billion years. Planets are thought to form early in a star’s history, however, and in 2014 a team led by Vanessa Bailey at the University of Arizona discovered a planet HD 106906b around the star weighing a hefty 11 times Jupiter’s mass and located in the star’s distant suburbs, an astounding 650 AU from the star (one AU is the average distance between Earth and the Sun, or 93 million miles). Planets were not thought to form so far from their star and its surrounding protoplanetary disc, so some suggested that the planet formed much like a star, by condensing from its own swirling cloud of gas and dust. The GPI and Hubble discovery of a lopsided comet belt and possible ring around the planet points instead to a normal formation within the debris disc around the star, but a violent episode that forced it into a more distant orbit. 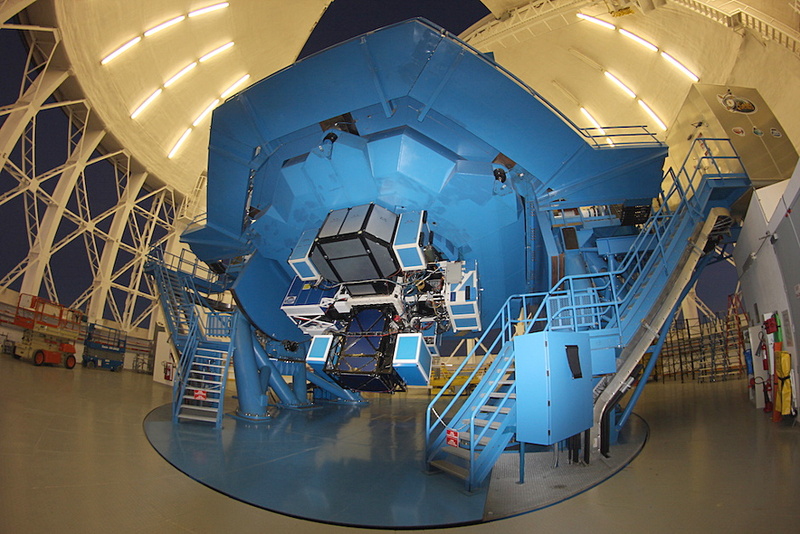 The Gemini Planet Imager (GPI) mounted on the Gemini South telescope on Cerro Pachón in Chile. Image credit: Gemini Telescopes. Kalas and a multi-institutional team using GPI first targeted the star in search of other planets in May 2015 and discovered that it was surrounded by a ring of dusty material very close to the size of our own solar system’s Kuiper Belt. The emptiness of the central region — an area about 50 AU in radius, slightly larger than the region occupied by planets in our solar system — indicates that a planetary system has formed there, Kalas said. He immediately reanalysed existing images of the star taken earlier by the Hubble Space Telescope and discovered that the ring of dusty material extended much farther away and was extremely lopsided. On the side facing the planet, the dusty material was vertically thin and spanned nearly the huge distance to the known planet, but on the opposite side the dusty material was vertically thick and truncated. Kalas and collaborators hypothesised that the planet may have originated from a position closer to the comet belt, and may have captured dusty material that still orbits the planet. To test the hypothesis, they carefully analysed the GPI and Hubble observations, revealing three properties about the planet consistent with a large dusty ring or shroud surrounding it. However, for each of the three properties, alternate explanations are possible. The inner belt of dust around the star has been confirmed by an independent team using the planet-finding instrument SPHERE on the ESO’s Very Large Telescope in Chile. The lopsided nature of the debris disc was not evident, however, until Kalas called up archival images from Hubble’s Advanced Camera for Surveys. Researchers have found that if organisms with nonphotosynthetic pigments — those that process light for tasks other than energy production — cover enough of a distant exoplanet’s surface, their spectral signal could be strong enough to be detected by powerful future telescopes now being designed. 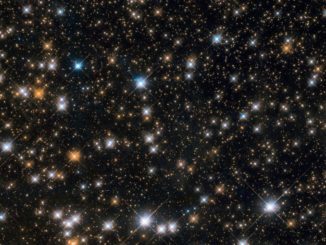 Stars in the Wild Duck Cluster, a favourite target for amateur astronomers, sparkle like jewels on black velvet in this view from the Hubble Space Telescope, showing the remarkably rich cluster’s colourful components with crystalline clarity. The artistic outburst of an extremely young star, in the earliest phase of formation, is captured in this spectacular image from the NASA/ESA Hubble Space Telescope. 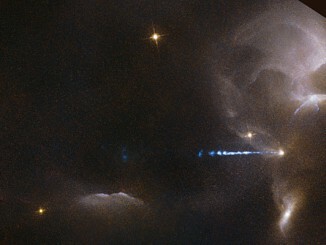 The colourful wisps, found in the lower left of the image, are painted onto the sky by a young star cocooned in the partially illuminated cloud of obscuring dust seen to the upper right.